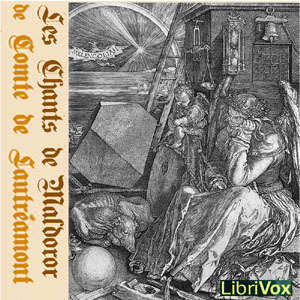 Les Chants de Maldoror is a poetic novel (or a long prose poem) consisting of six cantos. It was written between 1868 and 1869 by the Comte de Lautreamont, the pseudonym of Isidore Lucien Ducasse. Many of the surrealists in the early 1900s cited the novel as a major inspiration to their own works and Les Chants de Maldoror, and its protagonist Maldoror, have continued to fascinate people since its publication. The work revolves around the misanthropic character of Maldoror, a figure of absolute evil who is opposed to God and humanity, and has renounced all ties to conventional morality and decency. The iconoclastic imagery and tone is typically violent and macabre, and ostensibly nihilistic. Les Chants de Maldoror is considered to have been a major influence upon French Symbolism, Dada and Surrealism.